I’m a decorating dummy. We have plenty of people that that are naturally talented but somehow, I missed that line. I can make reasonably attractive cupcakes by sticking with a few basic techniques. I can make cupcakes that taste good. And that’s my priority—making them taste good. But they still need to be reasonably attractive. Add goodies to the batter. Usually, I add cinnamon chips or raspberry, strawberry, or blueberry tidbits. You can add nuts or coconut. You can add chocolate or other baking chips. Add 3/4 to one cup chips or tidbits. Fold them in after the batter is mixed so that they don’t melt in mixing and tint your batter. Add flavors and colors to the batter. You have an incredible array of flavor choices with warm flavors like butterscotch or caramel and fruit flavors from apricot to blackberry. To get enough flavor, it will usually take two teaspoons flavor. Add a coordinating color. Americolor professional food color gels come in 27 colors. Add a filling. I don’t remember the last time that I made cupcakes without a filling. It’s just too easy and adds too much. Use premade pastry fillings. Snip a quarter-inch corner off the bag, insert the cut corner in the top of the cupcake, and squeeze. When you frost the cupcakes, you’ll cover the holes. You can fill a dozen cupcakes in a minute. I use Bavarian cream pastry filling most often but I also love raspberry and lemon. They’re all good. Make the frosting good. There are a ton of great frosting recipes out there. I love butter and cream cheese based frostings. Seven Minute Frosting is very good. I don’t care for shortening. A half teaspoon of flavor and couple drops of color can transform an ordinary frosting into something memorable. Add toppings that taste good. Most toppings are sugar and color. They’re for show, not flavor. And I’m not too fond of big chunks of candy on my cupcakes. Our new favorite toppings are the chopped bark toppings. They pack a lot of flavor. If you load your cupcakes up, you’ll add a layer of flavor to your cupcakes. You can add more flavor to your cupcakes by spreading a layer of jam or pastry filling over the cupcakes before adding frosting. That’s especially easy to do if you’re piping frosting onto the cupcakes rather than spreading the frosting. Even a decorating dummy like me can make cupcakes reasonably pretty. I love making Boston Cream Pie Cupcakes (they’re very good) because all I have to do is dip the cupcake tops in melted chocolate and let the chocolate set. Use pretty colors and pretty decorations. There is no reason not to use pretty colors and colorful decorations. We have 27 colors, 16 colors of jimmies, and decorating sugars, not just in standard colors but less used colors from black to sage. Chopped bark toppings are two-toned, are pretty, and add flavor. Decorations go a long way in masking imperfections in the frosting. Don’t be afraid of a pastry bag. For most cupcakes, we use a pastry bag; it’s faster and easier than spreading frosting. If we have a lot of cupcakes to do, we use a large disposable pastry bag and either a star tip or a round tip. A Note about Bark Toppings: To Sprinkle or Dip? Bark—like almond bark—is a confectioner’s delight, a melding of white chocolate with another candy. This bark is cut into pieces perfect for cookies, cakes, and cupcakes. The nuggets are full of flavor. They are also pretty, two-toned. If you are only interested in pretty, sprinkle the toppings on your cupcakes. 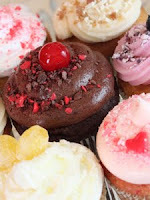 (Be sure and set the cupcakes on a plate so that you can recover any sprinkles that slide off the cupcakes.) If you want pretty and flavor, dip your cupcakes to get more decorations on your cupcakes. 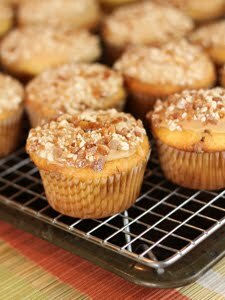 To do so, fill a small bowl with topping–a bowl slightly larger than a cupcake is perfect. And then invert the cupcakes into the bowl with a rocking motion to cover the top with pieces. This is a terrific apple cupcake recipe. 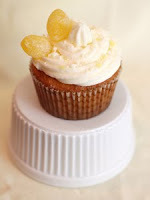 The cupcakes are made with a box cake mix–either yellow or white—with cinnamon chips added. 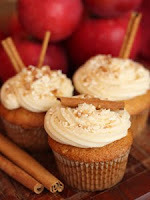 They are made with an apple filling, a caramel frosting, and topped with cinnamon apple bark topping. Make a batch of cupcakes with a boxed yellow or white cake mix. Add 3/4 cup cinnamon chips to the finished batter. Bake the cupcakes. Let them cool on a rack. Snip a quarter-inch corner off a bag of apple pastry filling. Insert the snipped corner into the top of a cupcake. Squeeze to fill the center of the cupcake. Repeat with the remainder of the cupcakes. Make the frosting—the recipe follows—and frost the cupcakes. Decorate with cinnamon apple bark topping or other decorations. This is a great caramel frosting and firm enough that you can spread if you like. No cooking is required. Melt the butter in a saucepan. Add the brown sugar. Cook and stir until the sugar is melted and bubbly. Remove from the heat. Add the milk and stir vigorously with a wooden spoon until smooth. Add the flavor. Add the powdered sugar and beat until it reaches spearing consistency. Spread the frosting while it is still warm. These are wonderful creamy cupcakes with a bright, lemon flavor. The cake is lemon, the filling is lemon, the frosting is a lemon cream cheese frosting, and it’s topped with lemon bark. Make a batch of lemon cupcakes with a boxed lemon cake mix. Let them cool on a rack. Snip a quarter-inch corner off a bag of lemon pastry filling. Insert the snipped corner into the top of a cupcake. Squeeze to fill the center of the cupcake. Repeat with the remainder of the cupcakes. Decorate with lemon bark topping or other decorations. This is a great frosting for lemon lovers. It’s a creamy frosting made with cream cheese that packs a lot of flavor. It works well with a pastry bag. No cooking is required. Beat cream cheese, butter, and lemon juice together with an electric mixer. Add three cups powdered sugar and beat until well mixed and fluffy. Add more as necessary to reach the desired consistency. Add the zest. Black forest is a mixture of chocolate and cherry. We used a boxed cake mix and filled the cupcakes with cherry pastry filling. 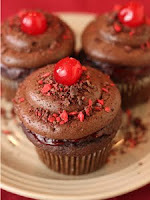 We used a chocolate buttercream frosting mix and added a teaspoon of cherry flavoring. We sprinkled the cupcakes with Black Forest bark topping. This recipe makes great cupcakes. Make a batch of chocolate cupcakes with a boxed cake mix. Let them cool on a rack. Snip a quarter-inch corner off a bag of cherry pastry filling. Insert the snipped corner into the top of a cupcake. Squeeze to fill the center of the cupcake. Repeat with the remainder of the cupcakes. Spread a thin layer of cherry pastry filing on the tops of the cupcakes. Make a chocolate buttercream frosting. We used a chocolate buttercream frosting mix. Add a teaspoon of cherry flavoring. Frost the cupcakes. Decorate with black forest bark topping or other decorations. These are blueberry cupcakes in five ways. 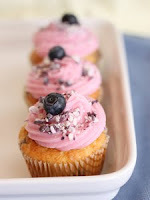 There are blueberry tidbits in the batter, the centers are filled with blueberry pastry filling, the frosting is made with a wild blueberry flavor, the topping is Wild Blueberries and Cream bark topping, and each cupcake is decorated with a fresh blueberry. 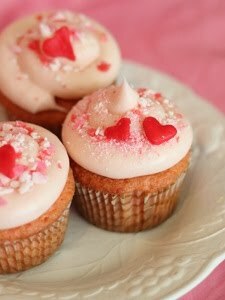 Make a batch of cupcakes with a boxed white cake mix. After the batter is mixed, add 3/4 cup blueberry tidbits. Bake the cupcakes and let them cool on a rack. Snip a quarter-inch corner off a bag of blueberry pastry filling. Insert the snipped corner into the top of a cupcake. Squeeze to fill the center of the cupcake. Repeat with the remainder of the cupcakes. Make your buttercream frosting. We used a vanilla buttercream frosting mix. Add a teaspoon of wild blueberry flavoring and a drop or two of Electric Purple food color gel or a blue food color of your choice. Frost the cupcakes. Decorate with Wild Blueberries and Cream bark topping or other decorations. Top each cupcake with a fresh blueberry. If you like apple pie, you’ll love this cinnamon apple pie cupcake recipe. It’s a wonderful combination of cinnamon and apples. Make a batch of yellow cupcakes with a boxed cake mix. After the batter is mixed, add 3/4 cup cinnamon chips. Bake the cupcakes and let them cool on a rack. Snip a quarter-inch corner off a bag of apple pastry filling. Insert the snipped corner into the top of a cupcake. Melt the butter in a small saucepan until it has started to brown. Watch it closely. It should be just amber in color, not dark brown. Let the browned butter cool for a few minutes then pour the clearer liquid off the top into a small bowl leaving the dark solids and a little liquid in the pan. Place the browned butter in the refrigerator to cool for about an hour. It should cool to a gel. Add the flavor and browned butter to the powdered sugar in a large bowl. Whip with an electric mixer. Thin with additions of milk as needed. These strawberry cupcakes are filled with a strawberry cream cheese filling and topped with a flavored cream cheese frosting. They are topped with a strawberries and cream bark topping. Make a batch of cupcakes with a boxed white cake mix. After the batter is mixed, add 3/4 cup raspberry tidbits and 1 teaspoon raspberry flavor. Bake the cupcakes and let them cool on a rack. Snip a quarter-inch corner off a bag of cream cheese pastry filling. Insert the snipped corner into the top of a cupcake. Squeeze to fill the center of the cupcake. Repeat with the remainder of the cupcakes. 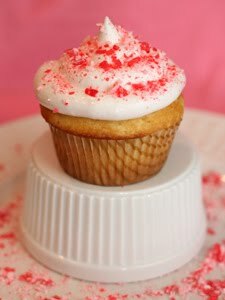 This is a creamy frosting made with cream cheese and strawberry flavor. You may add red food coloring or pink food coloring to tint it pink if you desire. It works well with pastry bag. No cooking is required. Beat cream cheese, butter, and flavor together with an electric mixer. Add three cups powdered sugar and beat until well mixed and fluffy. Add more as necessary to reach the desired consistency. Add the color. 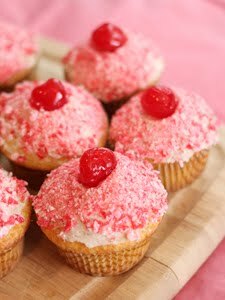 These are wonderful cherry cupcakes with a bright, cherry flavor. The cake is white, the filling is cherry, the frosty is a light, fluffy, seven-minute frosting made with cherry flavor and just enough color to tint it cherry blossom pink. It’s topped with cherry bark. Make a batch of cupcakes with a boxed white cake mix. Add a teaspoon of cherry flavor and a couple drops of red food coloring to the batter. Bake as directed on the package. Let them cool on a rack. Seven minute frosting is wonderful. Though it must be cooked, it’s easy to make: You whip it with an electric mixer as it cooks on the stovetop. At the end of the cooking, add the flavor and color. It works well with a pastry bag. Combine the sugar, egg whites, cream of tartar and cold water in a large saucepan. Beat with a handheld electric mixer for 30 seconds. Place the pan over very low heat and cook for seven minutes beating continually or until stiff peaks form. Remove from the heat. Add the flavor and color. Beat for two or three more minutes until the desired consistency is reached. Dennis Weaver is the founder of The Prepared Pantry and the author of How to Bake, a 250 page book that you can get for free. You can get a dough press and other baking tools and supplies at the company’s store as well as a free e-book of yummy desserts at the company’s site.